Hashknife Horses is located 4.5 miles north of Shepherd, MT. Shepherd is located approximately 13 miles north-east of Billings off of Highway 312 between Interstate 94 and Billings’ Heights. To see us, exit I-94 at the Huntley Exit 6, follow the signs into Huntley and to Highway 312 (1.6 miles). Turn west (left), cross the Yellowstone River, and go 1.3 miles until reaching the flashing yellow light. Turn north (right) onto the Shepherd Road. We are straight ahead approximately 7.3 miles. 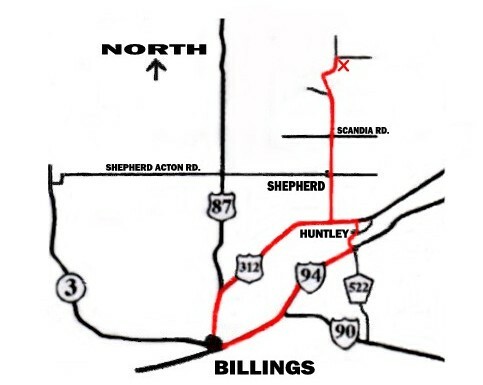 From the Billings’ Heights, we can be located by traveling east along Highway 312 until reaching the flashing yellow light at the Shepherd Road (7.5 miles) from the intersection of Highway 87 North. Turn north at the flashing light (left) and proceed approximately 7.3 miles.